Many compositions are very dependent on what is going on above, which means it can take scores of attempts to get the image. Though my desire to photograph the Supermoon was again thwarted this month (it was not visible at the horizon in July or August, either) I had a feeling I might be in for some nice color at sunset. 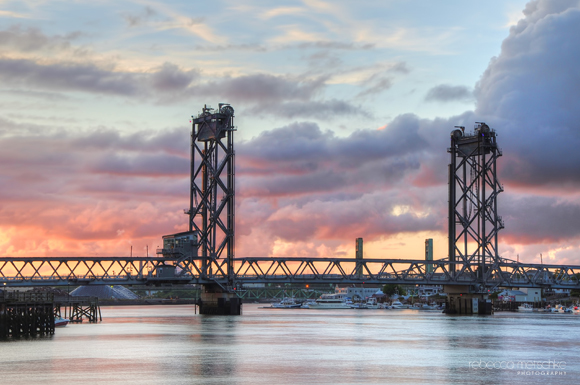 Calling an audible at the last minute, I opted for a location on the Piscataqua River so I could catch some of the best of the clouds along with the bridges which connect Portsmouth and Kittery (Maine). While I didn’t get my moon shot, or the lighthouse along with painted clouds (fallback option 2), this was a nice view. The sky is that beautiful old parchment in which the sun and the moon keep their diary.